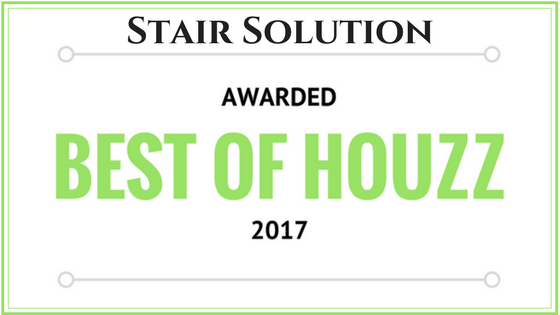 Alpharetta, GA, February 19, 2017 – Stair Solution of Alpharetta has won Best Of Home Design on Houzz®, the leading platform for home remodeling and design. Atlanta’s staircase remodel and railing experts was chosen by the more than 40 million monthly unique users that comprise the Houzz community from among more than one million active home building, remodeling and design industry professionals. Since 2003, our licensed and insured team has been working with homeowners and builders to enhance homes all over Atlanta and the surrounding areas. We stage and pre-stain materials in our shop, prior to arriving onsite – reducing construction time from 5 days to 1-2 days and eliminating the worry about harsh chemical fumes, spills, and dust in the home. Our success comes from a focus in both the residential and commercial industries. Our offerings include handrail systems for interior and exterior with traditional or modern designs in wood, glass or metal.